Are you faced with a couple of stubborn pounds that are almost impossible to lose? Do you think you’ve tried everything to lose them only to get back on the scale and find them blinking back at you cheekily? If this sounds like your situation, then perhaps you need to think about getting yourself a nice sweat suit to show those last few pounds who is the boss. A sweat suit or sauna suit helps you lose the excess weight by making you sweat more on your workouts as well as boosting your metabolism to kick those last few pounds down the curb. These suits have come a long way from the PVC tracksuits of yore—although they’re still available if you want them—and have upgraded to neoprene variants that are a lot more flattering and safer while offering a greater degree of mobility. But, as you well know, these suits are not created equal. To make things easier for you, I have compiled a list of the best sweat suits for women as well as a few tips on what you should look out for when buying your next investment on your fitness journey. Not all gym outfits are created equal and sweat suits are not exempted from this. The best sweat suits for women should not only look good but feel good as well as do the job they are supposed to. 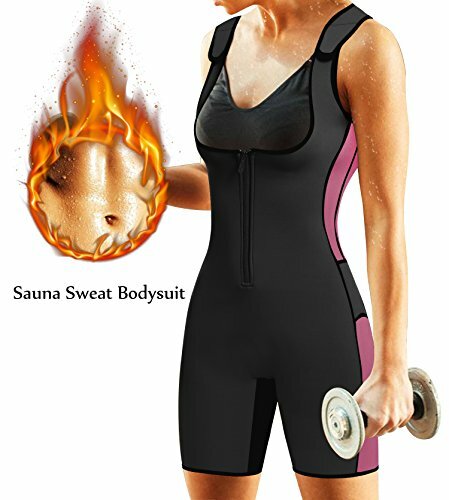 If you’re looking for a sauna suit with scientific backing, then you need not go further than the ones made by Kutting Weight. These neoprene sweatsuits have been used in studies by the American Council on Exercise and were proven to not only be able to help athletes acclimatize to warmer regions, but have also shown promising results in weight loss in overweight persons. Kutting Weight sweat suits are created with 2.5 mm elastic neoprene and have mesh ventilation zones in the underarms and inner leg areas to allow excess heat to escape. This prevents the nasty effects of overheating such as dehydration, electrolyte imbalance, and heat stroke that are unfortunately common in sweat suits. With regards to durability, these sweat suits also come with triple reinforced stitching so you don’t have to worry about your suits ripping at the seams while you run through your fitness routines. Front zippers are available for convenience with zipper flaps to protect your skin from irritation. How about a sweat suit that makes you look good while giving your metabolism a boost? This is precisely what the BRABIC sweat suit does—it effectively traps your body heat to boost your metabolism while you sweat it out while tucking in the unsightly flab you wish would disappear already. If you want a sauna suit that does what it is supposed to while making you look great, then this is it. This sweatsuit is made of elastic neoprene material, which is one of the best materials for the modern sweatsuit. It effectively traps your body heat while you exercise, which in turn, will boost your metabolism and help you make the most of your workouts. Because it is elastic, it will not hamper your body’s movements so you can stretch and twist as much as you can! Zippers are located at the front for convenience and the straps are adjustable so you can tailor this sweat suit to accommodate your size. It also comes with mesh ventilation zones in the underarm and groin areas to safely let out the excess body heat and prevent overheating. Sweat suits have come a long way since the 80s and 90s. Back then, it was fairly common to hear of celebrities fainting in their shiny PVC tracksuits from overheating. Nowadays, most women still like to use sweat suits to shave off a few stubborn pounds but the material and the design has evolved much since then. Using neoprene has made sweatsuits a lot safer, durable, and does not restrict movements the way the less elastic PVC does. Like both sweat suits mentioned above, it features a mesh ventilation area in the underarm and crotch regions to allow excess heat to escape and prevent overheating the wearer. It also has a full-length, central zipper with a close button to prevent the zipper from slipping during those intense workouts. There are some of us who plan to use sweat suits outside of the gym and fitness areas. If I can sweat it out in my brand new sweat suit while rocking my household chores, why not, right? Double points if you can wear it to work! These sweatsuits from Sisyama sure do make you sweat a lot and can be worn under a shirt and jeans. You can wear them with scrubs, too, but be prepared for a total sweat fest. They can be very comfortable under your clothes but they do their job as sweat suits quite well! Us ladies absolutely love it when you can hit a couple of birds with one stone, right? So if you give us a sweat suit that doubles as a body shaper and provides a bit of compression to ease the post-workout soreness, we’re all ears. The DoLoveY Neoprene Full Body Shaper Sauna Sweat Suits are made of 80% neoprene and 20% nylon, which should provide a nice elasticity and flexibility to the material to permit a wide range of motion while keeping those flabs tucked in nicely. 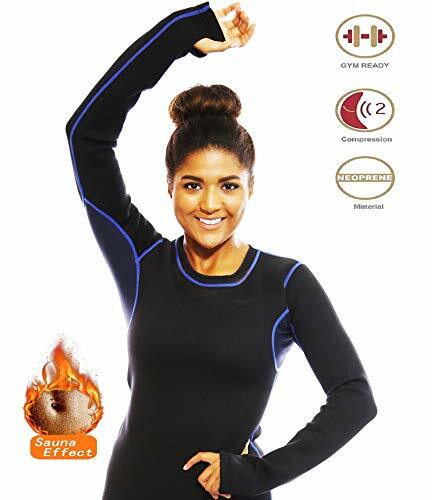 The material, called Airprene, is a new innovation that consists of three layers that maximize the retention of body heat to up your metabolism and make you sweat a lot while maintaining some degree of comfort. This is actually light and comfortable enough to be worn underneath your everyday clothes the way you would use a regular body shaper but be prepared to sweat it out if you do. ​When it comes to the best sweat suits for women, I generally prefer neoprene over other materials like nylon or PVC because it is more durable, affords a greater range of movement, and looks way better than a glorified plastic bag. Extra points if it has ventilation zones because overheating while trying to be healthier is just nasty and defeats the purpose. This sauna suit from Body Spa not only fits the bill with its high-quality neoprene material. It also meets my requirements for the mesh ventilation zones in not just two but four areas—the underarms, derriere or crotch, and the inner legs. All this without affecting the sauna effect you need to lose those stubborn flabs. Unlike most other sweat suits, the manufacturer also issues a warning to their buyers to discontinue use if they feel any discomfort. There are horror stories all over the Internet of women unwittingly erupting in hives due to some allergy to the material of the sweat suit. For a company to give some sort of warning to their consumers instead of foisting their products on them recklessly speaks volumes about how much they value their buyers. Women are built differently compared to man. This here is a fact, you guys. Unfortunately, a lot of sports and fitness equipment are geared towards the male population and it’s a great day when you can find something unisex that actually suits your needs. TNT Pro Series understands these differences. Instead of making another unisex sweat suit, they made two that are tailored individually for either the male or the female of the species. 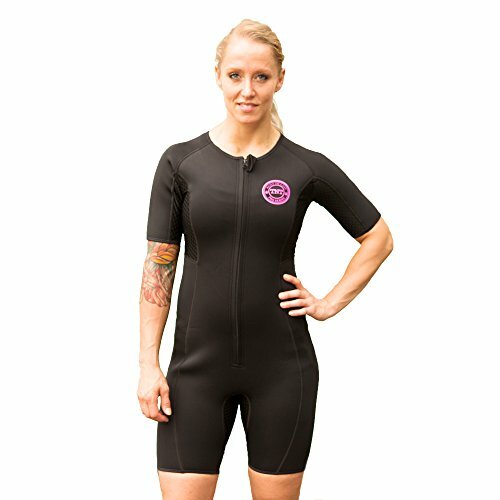 With a lot of humor, the company presents a sweat suit that effectively traps body heat and uses that same body heat to enable their suits to mold comfortably to the body, ensuring that you get that metabolic boost to lose weight effectively while making the whole experience quite comfortable. Ladies know that a good outfit can make or break a good workout. You can have a great routine but if your outfit does not cut it, it could become more of a hindrance instead of boosting your workout. The same thing holds true when choosing the right sweat suit or sauna suit—a good one will give you that nice boost in your metabolism to help you shave off those excess pounds while a bad one could not only limit your movements but could prove downright dangerous. When choosing the best sweat suit for your routines, it is best to keep several things in mind. These are not hard and fast rules but some key points you can use in selecting the best sweat suit for you. When you’re looking to buy something, the first thing you should check out is the material! Right now, sweat suits have literally flooded the online market and you could get them for really cheap. Some of these might be good buys but there are also some that are pretty much disposable after a couple of uses. PVC or polyvinyl chloride is quite literally plastic. It is cheaper than sweatsuits made of nylon or neoprene. Although it actually works in the sense that it ups your body temperature during workouts and makes you sweat a lot, it is not a very good material for sweatsuits as they can get ripped rather easily. It also has zero breathability, which could cause overheating during exercises and can be dangerous. Nylon is a step up from the PVC sweat suits that are everywhere. They are generally tougher than PVC suits and could last a lot longer. However, bacteria like to make their homes in this material and live off the moisture your body gives off during a particularly sweaty session. Like PVC, it enables you to trap body heat but does not provide a way for your body to blow off the excess heat, which can put you at risk for overheating. The best material for sweat suits is neoprene. This is a synthetic rubber material that effectively traps body heat to boost your metabolism but allows your body to cool off naturally. Because it is a rubbery material, sweat suits made of neoprene are a lot more stretchable and will not limit your range of movement during exercises. This also makes them less susceptible to ripping, which is a common problem with PVC suits. Generally speaking, sweat suits that are manufactured by a reputable brand cost a lot more than run-of-the-mill ones. These brands have a reputation to uphold and spend a lot more on marketing their products than other lesser known brands. These well-known brands also tend to spend more on the materials and technology to create their products, which boosts prices in turn. However, this does not mean that a no-name sweat suit is practically garbage! There are sweatsuits from smaller brands that do very well for themselves but have not benefited from a marketing hype. As with your usual fitness outfit, your sweat suit must fit you well so you can reap its benefits. Some suits are baggy and come in the sweatshirt-and-pants combo that is reminiscent of the 80s and 90s. While these might be alright for jogging or walking and can even be adjustable to a certain degree with drawstrings, these baggy designs tend to be a lot less accommodating for other types of exercises and can become a hindrance. They also have the tendency to rip easily, making them practically disposable after just a few uses. 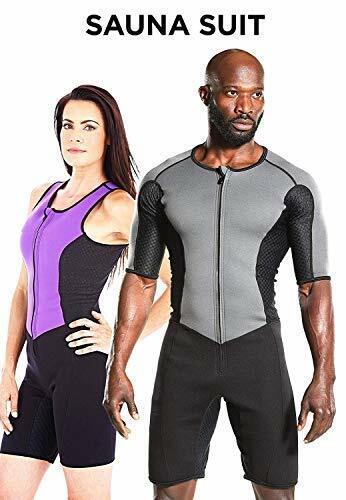 For the stretchable options, like sweat suits made of neoprene, the fit is very important as a loose suit would not look good and a tight one might cut off your circulation. While these suits tend to allow more range of motion, they are meant to fit you well enough to be your second skin. If your sweat suit is poorly made, this could result in chafing, which is just as much a hindrance as a suit that limits your range of motion! In sweat suits of this type, try looking for zippers that will not rub at your skin during exercises and flatlock seams that will not chafe. I will be honest and say that I will probably not wear a sweat suit that will make me look like the next laughingstock at the local gym. Men generally tend to care less about looks as long as a sweat suit will do its job like it’s supposed to. It is a lot different with women because admit it or not, we derive an added boost of confidence and motivation from our workout clothes. I mean, I am practically itching to exercise when I have a cute, new outfit! Sweat suits have come a long way from the shiny, sweatshirt-and-drawstring-pants combination that was all the hype in the 80s and 90s. Nowadays, they are more streamlined and a lot more flattering, while providing a nice boost to the metabolism during workouts. Who doesn’t want to spend a few, relaxing minutes in a sauna? Your mind and body practically relax as the tension leaves your muscles. You can also feel the nasty toxins exiting your body through the sweat pushing out of your skin. A sweat suit is also known as a sauna suit because it achieves the same effect a sauna is supposed to—increasing the body temperature and helping your body detoxify by making you sweat a lot. However, aside from that, the right sweat suit not only helps you shave off those last, stubborn pounds, it can also have benefits that stem from the increase in body temperature. A study done in August 2017 shows that sweat suits can help athletes acclimatize to warmer weather conditions. This might not mean much to you if you plan to exercise in a mostly constant environment without fluctuating temperatures. However, if you are used to colder climates and need to compete in a country with sweltering heat, you could use a sweat suit to help your body get used to the increased temperature during training. A more recent study done in November 2017 also shows that wearing a sweat suit not only benefits athletes but normal, overweight people, too. This study included 45 participants who had a Body Mass Index or BMI of 25 to 40 kg/m2 (normal BMI ranges from 18.5 to 24.9 kg/m2) and had a body fat percentage of at least 22% for men and 32% for women. They also had to have a sedentary lifestyle, which means they had very little physical activity. These people were divided into three groups—the control group, the exercise group, and the sweatsuit group. The control group did nothing and went on with their lifestyle. The exercise group and sweat suit group were made to perform similar progressive exercise programs with the difference being that the sweat suit group had to wear sweat suits during their exercises. At the end of the study, both exercise and sweat suit groups managed to lose weight. However, those in the sweat suit group did significantly better than the exercise group not only in losing weight but in decreasing body fat percentage as well as boosting cardiovascular endurance. This means that the effects of wearing sweat suits are not merely due to temporary water loss, which can be regained after resuming a normal diet. Instead, they have significant long-term results in that they not only decrease the weight but the body fat percentage, too, while boosting cardiovascular endurance. If you have tried everything to get rid of those last few pounds to make it to your target weight, then perhaps you should try sweating it out in a sweat suit. Sweat suits have come a long way from the tacky, shiny sweat suits of the 80s and 90s. Most sweat suits for women nowadays are sleek, neoprene suits that work to flatter your shape while retaining the heat your body generates during exercise. In turn, this heat works to boost your metabolism and make you sweat even more so you can get rid of the excess water weight. A good sweat suit also has mesh ventilation zones to allow excess heat to escape. Overheating can be dangerous and result in nasty complications due to dehydration, electrolyte imbalance, and heat stroke. Aside from these ventilation zones, topnotch sweat suits are also made of a breathable fabric while retaining the body heat needed to make you sweat a bit more. Although it is a bit pricier than most sweat suits in the market, the Kutting Weight sauna suits have been proven to do the job that a sweat suit is supposed to do. Studies conducted by the American Council on Exercise have shown that these particular sweat suits safely and effectively retain body heat generated during exercise and boost metabolism and weight loss significantly. Have you ever used a sweat suit to help lose weight? What are your experiences and recommendations for the best sweat suits for women? Let us know your thoughts in the comments below! Crush Your 2018 Fitness Goals with the Best Training Shoes for Women!